On Wednesday, the day after the collapse of Genoa’s Ponte Morandi killed thirty-nine people, a civil engineer told la Repubblica that three hundred other bridges and tunnels around Italy are in a similarly extreme state of disrepair. Tellingly, this “engineer M.” spoke to the newspaper on the condition of anonymity, in order to avoid offending the unscrupulous private interests hired to maintain Italy’s thoroughfares. The collapse of the motorway bridge is the latest and worst of a string of fatalities caused by roads and railways that no one bothers to keep in proper condition. Before Tuesday’s disaster, five Italians had already died in seven major road bridge collapses since 2013. In January, three people lost their lives when a train derailed outside Milan. In July 2016, twenty-three people were killed when two trains crashed along an outdated single-track railway in Puglia. Nor were the death tolls in earthquakes in Amatrice in 2016 (299 fatalities) and Aquila in 2009 (308 killed) mere natural disasters: investigators found that many buildings had not been adapted to earthquake proofing standards dating back to the 1970s. If this was considered “too expensive,” in the end the state ended up picking up a €20 billion reconstruction bill. 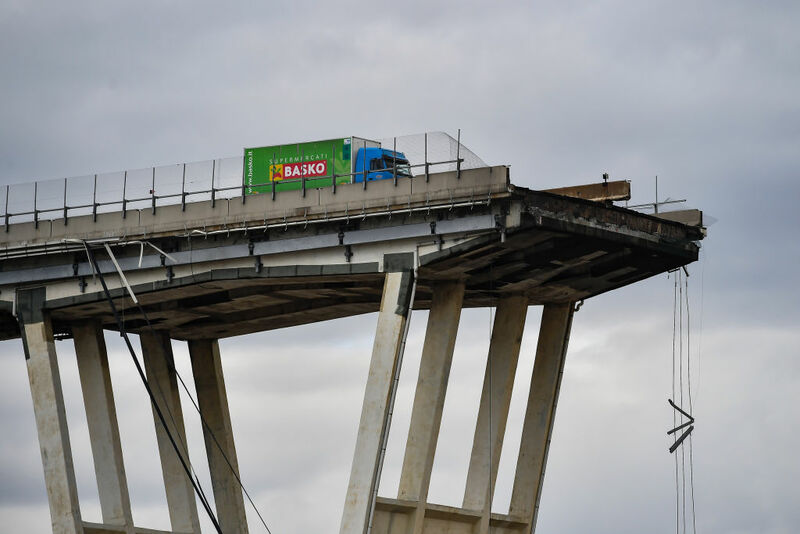 Since Tuesday, scrutiny has turned on the privatized Autostrade per l’Italia, which operates the bridge. The government rushed to announce the firm would lose its concession (covering near half of Italy’s motorways), before backtracking yesterday, instead saying that this could “eventually” happen. In fact, even privatization’s recent failures have done little to strengthen calls for the Italian state itself to renovate national infrastructure. This owes not only to soaring public debt, or budget deficit constraints imposed by Brussels, but a decades-long series of white elephants that ended up mired in corruption. This has fed Italians’ distrust of public spending and pessimism about promises of economic stimulus. The bulk of Italy’s road infrastructure dates back to the 1960s and 1970s, including the Ponte Morandi. Since 1999, when it was sold off by Massimo d’Alema’s center-left government, the motorway network has been under the control of private interests. This was an act of asset stripping, as well as a reflection of the cult of “public-private partnerships” so dear to Tony Blair–era European social democracy. As Five Star (M5S) leader Luigi di Maio himself pointed out after Tuesday’s disaster, the deal resulted in Italy having among the highest road tolls in Europe, managed by cost-cutting firms who pay low taxes in Luxembourg. News reporting on the Genoa disaster has aptly highlighted the general poor state of Italian infrastructure. Still, this is no uniform picture. The high-speed trains running from Venice to Naples or Milan to Bari (if no further south) are prohibitively expensive for many Italians, who are forced onto slower and more cramped treni regionali. They are nonetheless far superior to, and cheaper than, anything that yet exists in, say, Britain. This Frecciarossa service is operated by the state-owned rail infrastructure and rail service companies (though officials have suggested its privatization is imminent). Where the logic of privatization and sell-offs have taken hold, Italy’s record is appalling. For evidence of this we need only look to Rome, home to “the world’s most expensive, behind-schedule metro line.” This state-financed project, originally supposed to be completed before the millennium but now “on schedule” for completion in 2022, was outsourced to private contractors in 2006. Around triple the original budget has been spent already; after two inquiries last month, proceedings began against twenty-five people (including former Roman mayor Gianni Alemanno) over accusations of €320 million in fraud and kickbacks. It is, in particular, the nexus of public works and subcontracting to private business that provides the happiest hunting ground for corruption, as various forms of bribery allow access to state funds. Private contractors involved in Milan’s EXPO 2015 paid an estimated €1.2 million in bribes in exchange for contracts worth €166 million; Venice’s MOSE flood defense project is estimated to have involved around €22 million in kickbacks. In Rome, the Mafia Capitale scandal exposed in 2014 saw a vast criminal organization take over city services from road repairs to hostels for refugees. The cost in undelivered services has been estimated at €1.3 billion. The effects are visible on the capital’s roads. International commentators were appalled when this year’s Giro d’Italia, one of the world’s top cycling races, was cut short because of Rome’s notorious potholes. Worse is the fate of the commuters who traverse the city every day; on average they will encounter such a hole every fifteen yards. This July, the mother of a twenty-six-year-old motorcyclist killed after running across a pothole began circling them in yellow paint, to make them visible; police warned that anyone taking such action would be fined. Dramas of a failing public transport system range from poorly maintained buses catching fire to the case of a four-year-old boy killed when he fell down a metro station elevator shaft. Rome’s Mafia-outsourcing scandal, implicating politicians across party divides, was an important milestone in the Five Star Movement’s rise to national government. In the wake of both this affair and the ludicrous expenses scandal that felled the Democratic Party incumbent, M5S’s candidate, Virginia Raggi, swept to victory in the 2016 mayoral election. In fact, Raggi would herself soon face police accusations of kickbacks, in turn forcing her M5S party to abandon its own internal anti-corruption charter. This investigation was later dropped, but Romans remain unimpressed by Raggi’s efforts at resolving the city’s transport dramas. The Genoa disaster has highlighted another element of the M5S’s record, in many regards connected to its anti-corruption agenda: a general distrust of public works projects. This is a party of “efficiency savings” and moral opprobrium against the corrupt, rather than one that seeks to reform the state or reverse privatizations. At the same time, it feeds on a mood in which many abandoned millions are suspicious of state spending and see grandi opere (big public works) as serving some hidden, private interest. This kind of cynicism is often well-founded, but ill-oriented to promoting an alternative vision of Italy’s future. In recent days, social media users have widely circulated a 2013 statement posted on the M5S website, in which it backed a campaign against building a second motorway over Genoa, the “Gronda.” In this (since-deleted) statement, originally written by a local committee against the Gronda, campaigners dismissed as a mere “fairy story” the prospect that the Ponte Morandi could be considered “close to collapse.” They raised this argument in order to deny the importance of building a second thoroughfare to alleviate traffic over the bridge. The M5S rode on such movements in its earlier phase, but have taken a less clear stance since entering government in June. Those seeking to highlight the M5S’s opportunism have naturally emphasized the fecklessness of the anti-Gronda statement’s dismissal of safety fears. But it is also worth noting that those who said the doomed bridge would last “one hundred years” had also added the important caveat: “if it is normally maintained, at standard costs.” The current evidence is that this is precisely what Autostrade per l’Italia failed to do; in a picture taken a few weeks before the collapse, the wear on the bridge’s underside is clear. It is also important to understand that, with public investment squeezed and even Keynesian stimulus projects marginal in public debate, a sort of “rivalry” develops between different projects. This statement, in fact, also protested that success could hardly be “measured in terms of the cubic meters of concrete poured” for roadbuilding projects at a time when Genova was struggling to maintain its flood defenses. In this case — as with the project to build a bridge from the mainland to a Sicily that itself has poor internal rail links — big-spending, headline-catching projects risk coming at the expense of more pressing local concerns. In reality, building a rail line to Lyon is hardly an alternative to maintaining the roads used by lorries: if rail freight accounts for just 6 percent of all goods transported in Italy, such figures are in fact common in similar European states (in Germany last year 8 percent of tonnage was carried by rail and 79 percent by road; the respective figures for the UK were 9 percent and 76 percent). If one does want to paint a picture of Italy lagging behind, the more striking divide is in terms of these countries’ overall public spending on infrastructure during the crisis period. According to OECD data, an Italy that invested €13.66 billion in roads in 2007 cut this to just €3.39 billion in 2010 before rebounding to €5.15 billion in 2015 — still just half the levels of Germany, France, or the United Kingdom. Beyond roads specifically, over the last decade Italy’s direct public investment has dropped by almost 40 percent. The tragedy is that even as parts of Italy’s infrastructure are visibly crumbling, and the country struggles to recover from the crisis, meager funds are continually channelled toward white elephant projects that serve business contractors (and in some cases, the politicians tied to them) more than they actually lead to the provision of public services. Wherever movements opposed to public works do insist on the need for spending in other areas, this aspect of their politics is ignored and they are treated by the dominant media as mere Luddites, in a context in which even Keynesian-style stimulus proposals lack strong political expression. Tuesday’s collapse had an added poignancy because it came the day before ferragosto, Italy’s bank holiday. It is likely that many of the thirty-nine victims were setting off on vacation; workers sifting through debris found at least one bucket and spade. But if officials blamed this week’s rising traffic for its ultimate collapse, it would be misleading to suggest that the strains on Italy’s roads are at historic highs. In fact, even at a traditional time for holidays, at one of the hottest points in the year, the crisis prevents millions from going away even for a few days: the number of holidays Italians take are down 44 percent since 2008. These figures have improved slightly since the lows of 2014–15, as have indicators like youth unemployment. But the sense of national crisis has not abated. One Italian researcher writing in Britain’s Independent compared the bridge collapse to the Grenfell Tower fire that killed seventy-two Londoners in June 2017. This could almost be termed a hopeful statement, insofar as the events at Grenfell served to mobilize residents and pushed Britain’s housing crisis, its negligent landlords, and their political accomplices into the center of public debate, however briefly. Historian Angelo D’Orsi more grimly termed it an Italian 9/11. When the planes hit the Twin Towers that September morning, one British Labour politician infamously sent colleagues a memo that this would be a “good day to bury bad news.” In his response to the Genoa disaster, Lega leader Matteo Salvini (today in government with M5S) instead tried to push his own more pressing concerns onto the agenda, noting in a tweet that despite the “bad news” of a bridge collapse casting dozens of people to their deaths, the day had also seen “good news”: that Italy would not have to take the African refugees who had floated for weeks on the Aquarius, after the government refused the vessel permission to enter port. While Salvini celebrated this political victory, it was M5S minister Danilo Toninelli who actually closed the ports. The M5S, “of neither Right nor Left,” feebly echoed Salvini’s tweets promising such action, while leaving him to claim “credit.” Indeed, such is the Lega’s success in defining the political agenda that while in March it won barely half as many votes as M5S, today the coalition partners are neck-and-neck in the polls. Seeking again to polarize politics around himself, on Tuesday Salvini blamed EU budget deficit limits for Italy’s low infrastructure spend. Such limits are indeed onerous; but it is hard to credit such claims from the Lega, whose plans for a 15 percent flat tax rate would starve state coffers of close to €100 billion a year. The M5S’s Toninelli is minister for infrastructure: the man that has the power to close ports to refugees is the same one that has ultimate control over the road and rail networks. If these latest fatti di Genova did, indeed, serve as a wake-up call for Italian politics, and for the M5S, perhaps it would develop a plan for repairing the nation’s roads, for filling in absent infrastructure, and recognize that the lives lost to rusting rail points or unmaintained bridges count for more than Salvini’s tax giveaway to the middle classes. But looking at what they’ve done so far, I wouldn’t count on it.